When it comes to your kids latex crib, or innerspring baby mattresses, we use the same fine natural materials that we use in our adult mattresses. With our natural dunlop latex, we up the firmness to 95-D, which we call extra firm. Under the top layer of organic cotton fabric,on the crib mattress, we use the same natural Wool from Northern California/Oregon. Made in the USA. Parents are always concerned with the safety of their kids cribs, so they make sure that everything they buy for their kids is safe. They want to know about the organic cotton surrounding the core of the crib mattress.The Organic Mattress Stores Baby crib mattresses are among the products that are preferred by moms and dads to ensure a healthier and happy baby. With one of our crib baby mattress, you can be sure that your little angel is sleeping on a surface that is safe. Don’t be fooled by Natural crib mattresses that mislead you in whats inside. 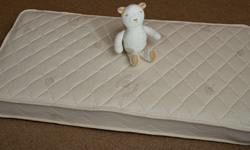 Remember for a latex crib mattress, the top layer is organic cotton fabric. Under the cotton fabric is wool. That is your natural fire retardant. the next layer is a 6″ core of natural latex . Flip it over and its the same ingredients on the other side. As for an innerspring mattress, the top layer is still organic cotton fabric. Kids will enjoy the cotton fabric, and the wool under that. The center layer is natural latex and if you flip it over its the same on the other side as well. Crib mattresses today are the best way to start your kids off in this hectic world of chemical laden products. Give your kids the best start they can get, with either an innerspring mattress, or a natural latex mattress. We have other organic baby products which are certified organic. Keep any baby mattress clean and dry with an organic wool mattress pad.